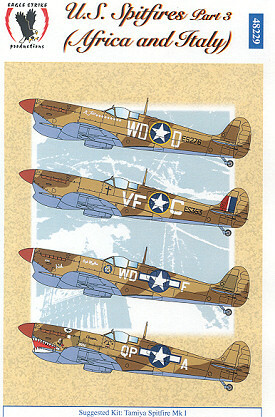 Here is a sheet for US Spitfires as flown in Africa and Italy. All four options are Mk Vc with the large sand filter. They are painted in standard desert schemes of Dark Earth/Middlestone over Azure Blue. They all have the red spinner, which was a Mediterranean theater ID marking for the Allies. All of these planes were with the 52nd FG. First up is the plane of Lt. S.D. Feld with his 9 victory markings. This aircraft is from the 4th FS. Then there is 'Helen/Louise' flown by Capt John Blythe of the 4th FS. This one has a white rear spinner plate. The fourth option was flown by Richard Alexander of the 2 FS and named 'Chappie'. This one has a large shark mouth. 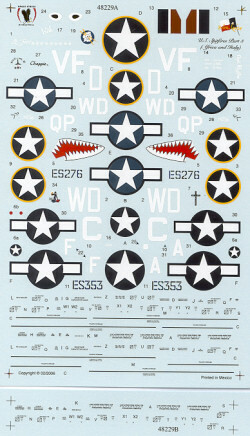 Eagle Strike provides full insignia for all and stencils for two along with a super stencil placement guide.